Opening hours: Shops are generally open 9am-12:30pm or 1pm and 4pm-7:30pm. Street markets are open 8am-1pm. The Brescia area is particularly well known for its lake landscapes - Lake Garda and Lake Iseo are reachable in less than one hour, and it's recommended to visit them for their atmospheric, breathtaking natural beauty. Here, with old castles emerging from water and greenery, you're likely to see unforgettable views. 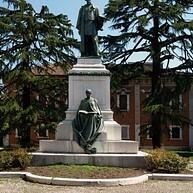 The center of Brescia also boasts Roman remains, Medieval and Baroque churches, and extensive collections of artworks, preserving the memory of Italy's diverse history and architecture. 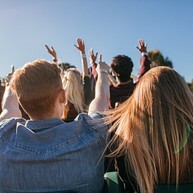 Moreover, Brescia is a popular destination for children and fun-lovers, near to the huge Gardaland amusement park, and to a refreshing water park for the summer. Not the oldest piazza in the city, but the most beautiful one. Here you can find Brescia’s town hall, the Palazzo della Loggia. The palazzo was begun in 1492, and the works lasted four centuries. Its huge, bulbous white roof is very distinctive. Opposite the palazzo, at the eastern end of the piazza, you will find the Torre dell'Orologio, a 16th century copy of the clock tower in St Mark’s Square in Venice. 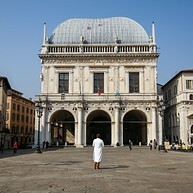 Formerly known as Piazza del Duomo, this is one of the oldest piazzas in Brescia and home to a number of superb buildings, including two cathedrals: the Duomo, La Rotonda and the Palazzo del Broletto. La Rotonda, also known as the Duomo Vecchio, was built in the 11th century on the remains of the Basilica of San Filastrio. 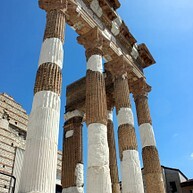 This is the only building of its kind in Italy – a huge cylindrical tower supported by eight pillars. The interior is simple and very beautiful. Head down to the very cold crypt to see the Roman remains. Some of the best Roman remains in Northern Italy can be found in the Capitoline Temple, constructed by the emperor Vespasian in 73 AD. Alongside are the remains of the theatre, thought to have held 15,000 spectators in its heyday. It was in use as a theatre until the 12th century. 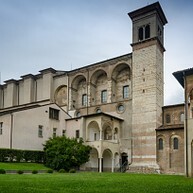 One of the most important archaeological museums in Italy, Brescia's City Museum is housed in the 8th-century monastery of Santa Giulia, which was founded by the Lombard King, Desiderio. This museum is well-worth seeing, not only for the huge quantity of exhibits, but also for the beauty of the buildings: the 8th-century Basilica of San Salvatore, the 12th century church of Santa Maria in Solario (see the stunning 16th-century frescoes in the oratory) and the 16th-century church of Santa Giulia. Closed on non-holiday Mondays. High above the city on Cidneo Hill, the castle was built between the 13th and 16th centuries. There are a number of museums up here, and the views over the city and the Brescia plain are great – well worth the effort of the climb up here! Brescia’s Teatro Grande is one of the most prestigious theatres in Lombardy – lots of red velvet, gilt and five tiers of boxes, its interior inspired by La Scala in Milan. Construction of the theatre began in 1803. The theatre has comfortable seating so don't forget to book your tickets in time and experience the magic. Here you will find a huge collection of primarily Italian art from the 14th-18th centuries housed in a 16th-century palace. The collection includes works by Raphael, Lorenzo Lotto and Tintoretto. Stop by and spend some time strolling among all the beautiful paintings - you will not regret it. 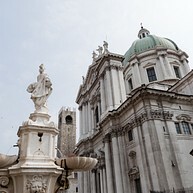 Brescia is a great jumping-off point for discovering the beauty of Italy’s lake district. Lake Garda is the biggest lake in Italy and is well-known for its pretty lakeside towns and villages, including the excellent windsurfing and sailing offers. Take the regular train (a short 15 minute trip) from Brescia to Desenzano del Garda; from Desenzano there are local buses, and lake ferries. Gardaland is Italy’s biggest theme park, located moments from Lake Garda. 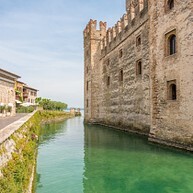 Take the regular train from Brescia to Peschiera del Garda (around 25 minutes) to get there quick - then you only have to take a shuttle-bus to the theme park itself. Children and adults alike will be thrilled by the many attractions that this place has to offer! One of the least known lakes in northern Italy, and much quieter than Garda. Check out the Franciacorta wine-growing district, south of the lake, or head to Monte Isola – the largest lake island in Europe, mercifully free of cars! 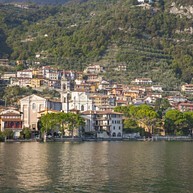 To get here take the frequent train from Brescia to the pretty town of Iseo, and then the lake ferry. Franciacorta Golf Club welcomes you to a 27-hole course in beautiful surroundings. It is located 185 meters above sea level, and parts of the course takes you through a small forest, by a lake and through the valley. Enjoy your time here! 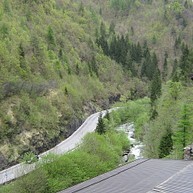 The "Valle di Inzino" is a lovely day-trip destination to go for a walk and enjoy a day out in nature. Admire the beautiful landscape and, during summer, take a cooling swim in the beautiful stream nearby. 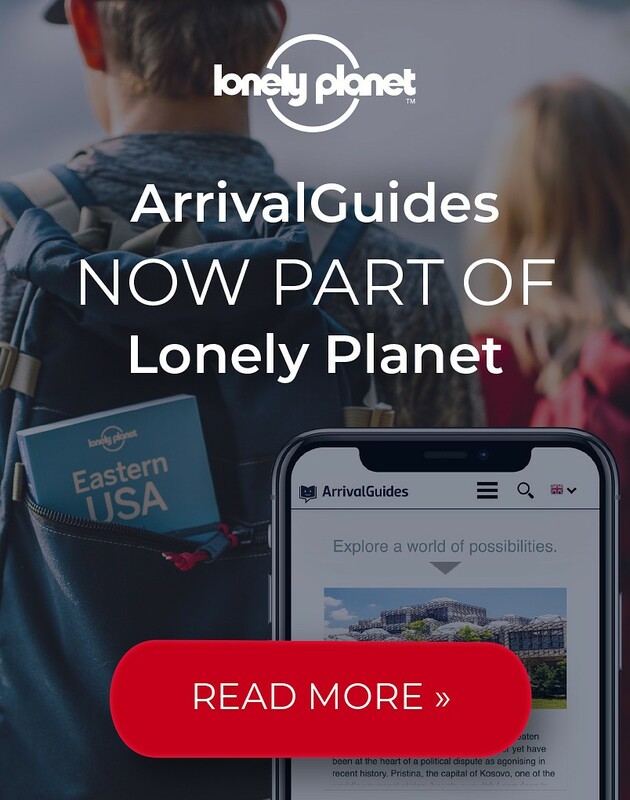 You will also find a restaurant. Bring you friends and family with you to share this amazing adventure. 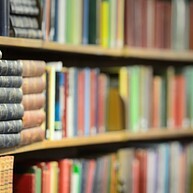 If you love books you have to visit Biblioteca Queriniana. The architecture of the building is amazing and should be visited for at least a quick stop by everyone. The library was built in 1705 and is located right next to the old Cathedral. Take a few steps and listen to the books. Enjoy a big swimming pool, fun slides and a playground with swings and other fun activities. Acqua Splash is suitable for both adults and children and is a good place to go to for a fun day in the sun. Share the experience with your loved ones.